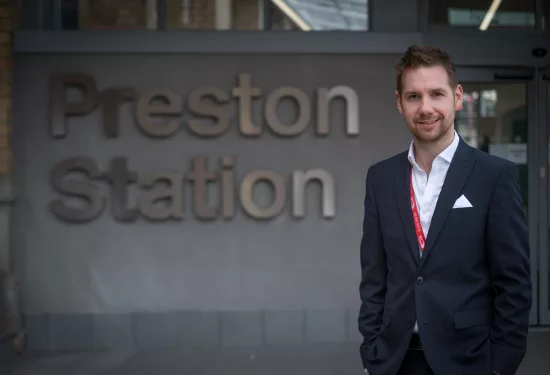 London, UK, 2017-Jun-28 — /Travel PR News/ — A new entrance at Preston station is now open, marking the completion of Virgin Trains’ £2m investment designed to enhance the experience for ever-growing customer numbers at Preston. Passengers travelling to or from Preston station can also now take advantage of free high-speed Wi-Fi on the concourse and platforms, as well as new retail outlets including Starbucks and West Cornwall Pasty Co. The refurbishment, which has taken place over two years, is the result of a £2m investment by Virgin Trains. Over 1.2m passengers have travelled on Virgin services between London and Preston during the last two years meaning the station is welcoming record numbers of people as Virgin Trains celebrates twenty years of running trains on the West Coast Main Line. Alongside station improvements designed to give customers more amenities, Network Rail have resurfaced platforms 3 and 4 to complement them. The heritage tiles on platforms 3 and 4 have also been restored. The new station entrance on Butler Street features a retail unit, Customer Information Screens and additional Ticket Vending Machines, offering direct access between platform 7 and Butler Street, as well as the multi-storey car park. In December 2016, the station’s Bike Hub was officially opened, following £500,000 of investment to transform facilities for cyclists. With space for up to 200 cycles, it is the largest of its kind on the West Coast Main Line and features a specialist cycling shop, managed by Leisure Lakes Bikes – a local family-run business. In addition to investing in new station facilities, Virgin Trains has introduced m-tickets across all routes along the west coast, an extended booking horizon to six months and launched its industry-first on-board entertainment portal, BEAM – all while making improvements to punctuality reaching a record 90.9% on the Anglo Scot route, which serves Preston. This entry was posted in Business, Society, Trains, Transportation, Travel, Travel Services, Travel Tips & Info, Travelers, Trips and tagged Anglo-Scottish, BEAM, Birmingham, Edinburgh, Glasgow, Lancashire, Leeds, Leisure Lakes Bike, Liverpool, Manchester, Michael Green, Michael Stewart, National Rail Passenger Survey, Network Rail, Newcastle, Preston station, Virgin Trains, West Coast Main Line, West Cornwall Pasty Co., York and London. Bookmark the permalink.